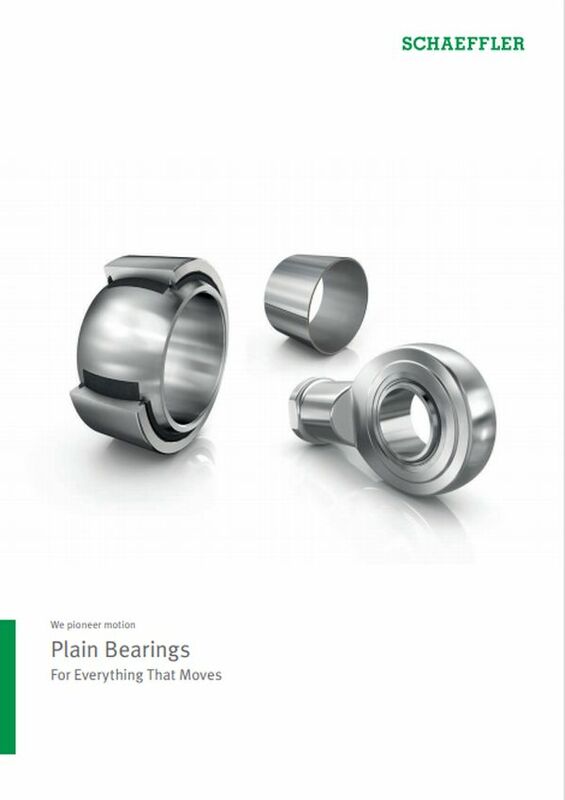 Schaeffler offers a comprehensive catalog of maintenance-free plain bearings. Innovative plain bearing materials are used here, such as ELGOGLIDE, ELGOTEX, and the metal-polymer composite E40. 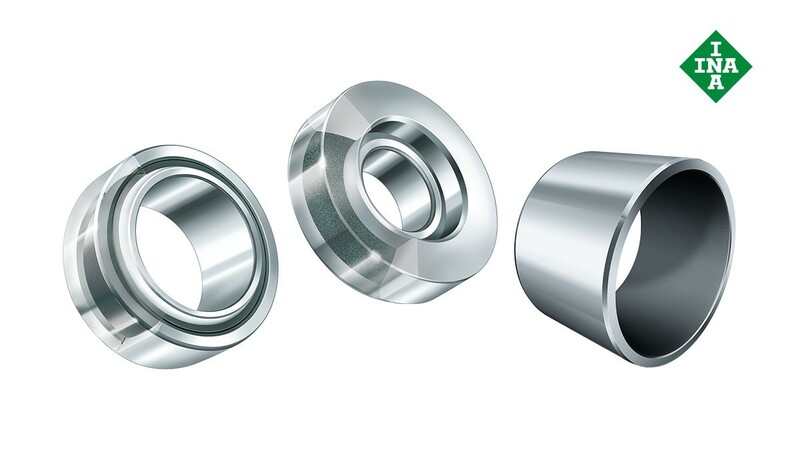 These PTFE plain bearing materials enable ultra-low coefficients of friction for spherical plain bearings and rod ends as well as bushes, washers and strips while ensuring low wear and very long life cycles. Maintenance-free plain bearings considerably reduce lubricant and maintenance costs as they do not require any oil or grease while also being very environmentally friendly. 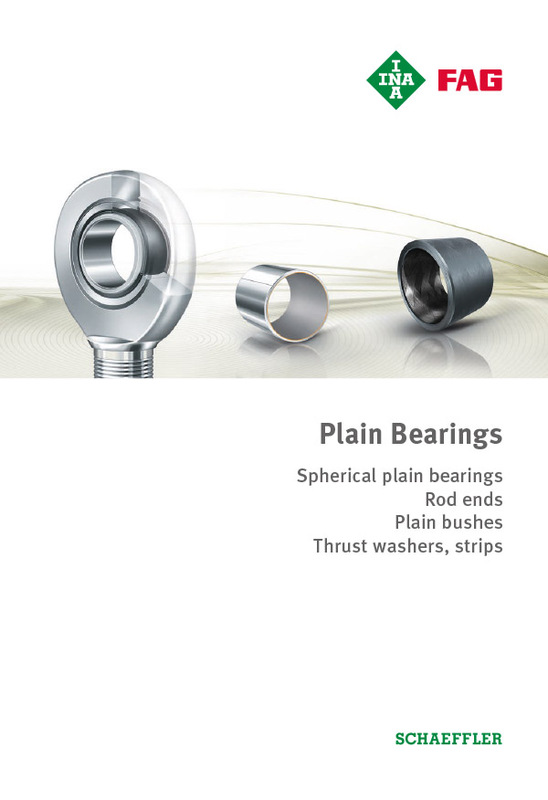 Angular contact spherical plain bearings comprise inner and outer rings with ELGOGLIDE®. In addition to radial loads, they can also support high axial loads. Maintenance-free rod ends comprise a housing with integral shank and a maintenance-free spherical plain bearing. They can support radial forces in a tensile or compressive direction and are suitable for slow movements with small or moderate swivel angles, for unilateral loads and under certain conditions for alternating loads (also suitable for alternating loads with GE..-UK-2RS ). Cylindrical plain bushes comprise a steel support body with ELGOGLIDE®. They allow not only swivel movements, but also axial movements and can support higher forces than conventional plain bearings. 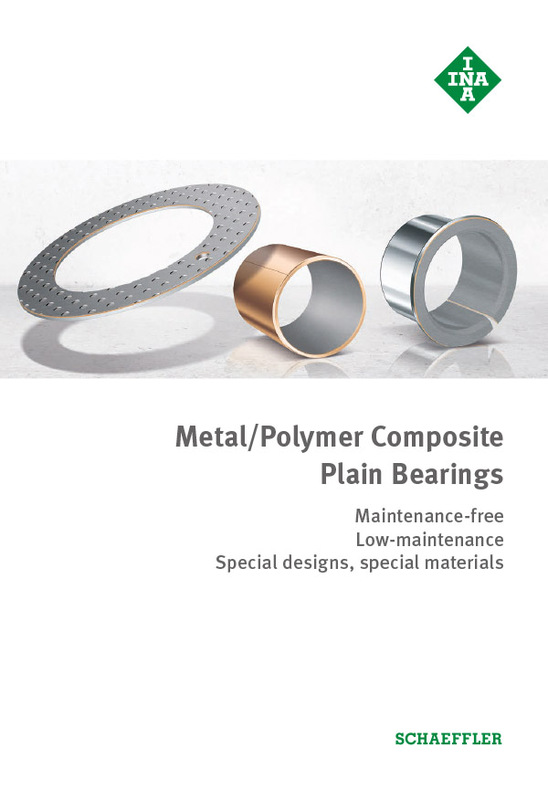 INA metal-polymer composite plain bearings are a cost-effective alternative for many industrial and automotive applications. All bearings are lead-free and, therefore, environmentally friendly. Different innovative material combinations ensure a large variety of materials. E40 is the Schaeffler Group’s new sliding material for maintenance-free metal-polymer composite plain bearings. There is no lubrication requirement over the entire operating life. The sliding layer is based on polytetrafluoroethylene (PTFE) with embedded chemically inert additives. The triple-layer material comprises the steel backing, the sliding layer and the running-in layer (see graphic). The steel backing has a sintered porous tin-bronze sliding layer with pores that are filled with the dry lubricant of the running-in layer. The Schaeffler Group supplies film type bearings with material E60 by agreement: This material is based on a lattice structure in which a sliding layer comprising PTFE and additives is rolled and sintered. The lattice serves both as a backing and a sliding layer. There is a sliding layer containing PTFE on both sides so that the sliding movement can take place on the inside and the outside of bushes. A further advantage of this material is its easy formability. 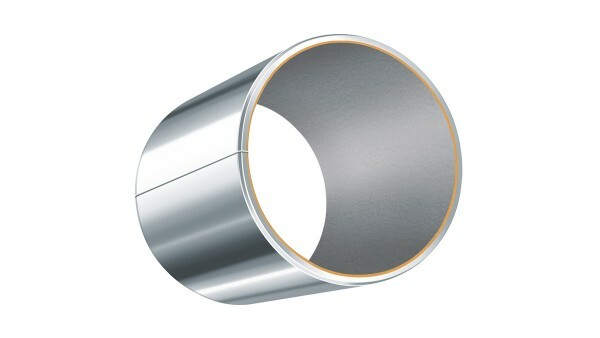 Typical applications for film type bearings are fittings and tools as well as hinges. 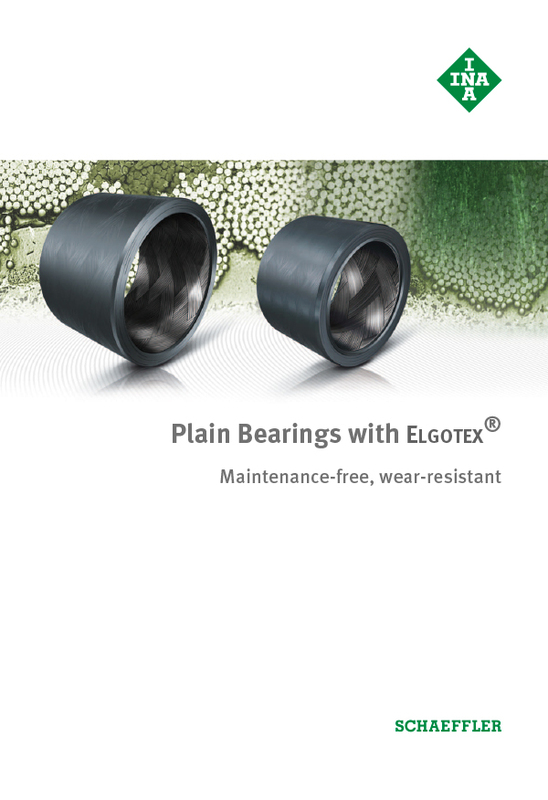 Plain bearings with ELGOTEX® are particularly suitable for dry-running applications in which high loads and vibrations occur. 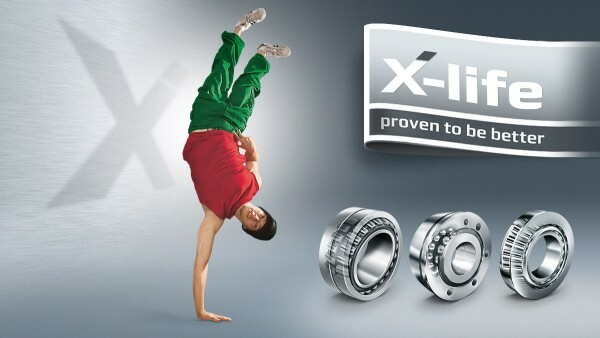 These bearings are maintenance-free throughout their service life due to the material combination used. How are the bushes produced? The bushes comprise two layers that are wound onto each other. The internal sliding layer ELGOTEX®, which is embedded in epoxy resin, is made of synthetic and PTFE fibers. The outer layer is made of continuous glass fibers (glass filament) embedded in epoxy resin. A specific winding angle of the glass fibers stabilizes the layer, thereby significantly increasing the strength of the bush. What are the advantages of ELGOTEX® plain bushes? A replacement for steel, bronze and plastic plain bearings in agricultural engineering and conveying technology, in metalworking machines, construction machinery, hydraulic cylinder guides, solar power plants, steel and hydraulic construction, etc.